Canine body language revolves around the same question that drives much social research, what is the nature of impulse control? I propose that a primal impulse can only be held in check by an impulse of equal primacy. Otherwise an individual will be in a profound state of conflict and will inevitably either succumb to temptation or develop a negative coping alternative. Furthermore, what animates and informs a dog’s articulation of its body, is simultaneously the predicate of impulse control. Currently however, impulse control is attributed by the mainstream to higher aspects of consciousness rather than lower. But this is unlikely because the inevitable conflict of a primal impulse that hasn’t been resolved will still be active and working to erode the capacity for self restraint. If an inappropriate impulse is to be held back in deference to a later benefit, it can only be checked by an impulse equally base, otherwise control over a basic impulse will fail. Impulse control is also posited as a diminishable resource, like an emotional reserve that is drained when taxed. I believe that impulse control quickly diminishes when a base impulse is being held in check by a higher cognitive faculty. But when a base impulse that restrains another base impulse, is reinforced by a positive experience and to the degree that a permanent imprint takes hold, then in this way impulse control can be seen as an almost limitless resource. Certainly what pro-social dogs exhibit given what they must endure, strangers in the home, vets poking and probing, groomers trimming and snipping, are examples of this possibility. In other words, when the controlling agency is extrinsic, impulse control diminishes with fatigue. But when control is intrinsic, it is augmented by experience and fatigue does not erode it. What follows below is an exercise in logic on the nature of impulse control that is based on the assumption of behavior as a function of attraction, in contrast to the current assumption that behavior is a function of intention. The latter assumption leads one to focus on higher cognitive functions as the source of the higher social virtues such as impulse control. This is incongruent firstly because we see such a high degree of social organization and reliable degree of self-less devotion to a caste-specific function in the lower phyla of life such as insects rather than suddenly arising in the most advanced species. In either system of analysis, Attraction versus Intention, one is making an assumption. There is no way around this. However the benefit of the former is that one is aware of making an assumption, whereas in the latter one is not since the intention seems self-evident and flaws in the logic that follows from this assumption are never addressed because they are never even apprehended. Therefore the Intention line of analysis doesn’t have the benefit of testing both avenues of inquiry. And since the Intention assumption (and the accompanying reflex to personify) is the default setting of the human mind, one should be suspicious of taking that path exclusively. Whereas the benefit of the former is that it already takes in the ramifications of the latter since intention-seeing is already a habit of the human mind. My treatment below is a speculation about what is going on inside a dog’s body and mind that enables impulse control based on the assumption of behavior as a function of attraction. What follows below I believe squares up far better with the latest scientific evidence on behavior than does the logic that follows from the intention assumption. This will also provide a basis for more fully understanding canine body language because first and foremost, any and all behavior, either between an animal and its environment or between an animal and another animal, represents a transfer of force. Body language is an economy based on the exchange of this force. The transfer of emotional force follows the exact same physics as the transfer of physical force. The following treatment unites these two domains, the language of the animal mind as expressed via the mechanics of the body. Consider the following interview with Frans De Waal, the worlds foremost primatologist. Question: How do you define empathy? From my reading of animal behavior I couldn’t agree more. In fact we could go even deeper into the parallel between the dynamics of emotion and the mechanics of motion in order to understand the evolution of impulse control, undoubtedly integral to empathy as well as all social virtues. My argument is that the only possible source of such a counterbalancing primal impulse would be as the equal and opposite COMPLEMENT to the impulse that needs to be countermanded. By equal I mean it must be base, it couldn’t be of a higher cognitive function because thoughts aren’t effective in restraining primal impulses without inciting conflict, and neither does the cognitive argument provide a logical path for the evolution of impulse control and deferred gratification. For example we find that dogs are better than apes at self-restraint (dogs will herd sheep through Prey Drive as opposed to killing sheep through Prey Instinct, not to mention their ability to live freely among us), and truth be told when properly raised are far more reliable in regards to self control than humans. Self-restraint and the capacity to modify primal impulses must be primal rather than advanced. However by opposite, impulse control wouldn’t mean doing nothing or going in the opposite direction, but rather it remains equal in that it is integral to the act of movement, and given that moving toward something is at the root of any behavior that needs to be held in check. It must be an impulse equally vital to motion as is the impulse that is to be restrained. In other words, holding back would still feel like getting somewhere (and thus the basis of a capacity to sense a potential gratification by deferring from the immediate impulse to move). So if the impulse to move is at the root of an action or sequence of actions that needs to be countered, then there would have to be an equal and opposite impulse integral to the act of movement that can be (1) isolated from the mechanics of movement and then (2) highlighted so as to neutralize the impulse to move. Only this would effect impulse control without inducing a state of conflict. There is only one possible candidate that is composed of two primal impulses in a complementary juxtaposition and with both components being integral to the act of going as fast as possible toward something one wants, or as fast as possible away from something one fears. This is the locomotive rhythm as detailed in “Design In Nature” by Adrian Bejan, the discoverer of the Constructal law, a principle of thermodynamics in conformance to which every aspect of an organism’s physiology has evolved, from the size of an organ to its placement within the body and therefore I would argue, the behavior an animal is capable of generating. The locomotive rhythm is the most efficient use of energy in order to propel the body as fast as possible with the least amount of effort. Because running as fast as possible toward something one wants, or as fast as possible away from something one fears, would be a physical metric of efficient action, an internal measure which registers within the animal mind on its most primordial level of organization that the individual is doing the best it can in whatever situation it may find itself in, this would therefore have evolved to constitute the emotional state of well-being even when the animal isn’t actually moving. It serves as a standard against which the emotional processing of stimuli and context is contrasted in order to arrive at a value. In other words, the mind processes emotion the same way the body processes motion. The locomotive rhythm writes the language of the body. The locomotive rhythm is composed of two complementary and equal phases: (1) Projection, extending the legs out fully into a maximum stride and (2) Collection, gathering the legs back under the torso in preparation for the next stride. In locomotion the “collecting” phase (gathering force back into the body) is as vital as the “projecting” phase, (throwing force from the body) because if both phases aren’t perfectly matched then an individual will either pancake on the ground or fall flat on its face. However the physical act of putting one paw in front of another is preceded by an emotional dynamic that is likewise predicated on the locomotive rhythm. First and foremost a stimulus represents an excitation of the organism so that to some extent it has been knocked out of a preexisting state of emotional equilibrium. In response the animal feels compelled to move, i.e. it has been “accelerated” and its subsequent behaviors are calibrated to return the emotional system to equilibrium and this means moving to the extent that this exhausts the “force” of acceleration. A return to equilibrium by exhausting the acceleration requires that there be a transfer of force, whether we’re talking about an individual moving from point A to point B or individual A interacting with individual B. Interacting with the environment or with other individuals requires a transfer of force. So before a physical act can occur the individual must gage if the environment or the other being is capable of absorbing said force. Emotion is a modeling program that uses the past to predict the future. It answers the question that precedes any action: “What will I feel forward in Time as I move my body forward in Space?” To answer this question, the emotional center-of-gravity (the physical center-of-gravity plus all physical memories of movement and emotional experience) is projected forward so that the dog from an autonomic survey of its past can project a feeling of its body forward in space in order to collect information as to what it is likely to experience when it arrives at the place or object it wants to get to. In short there is an emotional momentum, an emotional projection of force, that precedes any action, a physical projection of force. The capacity for emotional projection is acquired during the imprinting period of early life when the individual is learning to move its body in the pursuit of what it wants or away from what it fears. All objects and places attain their emotional relevance, and are thereafter categorized through experience, as to whether or not they can absorb and/or conduct the individual’s emotional momentum. In other words, the process of objectification, the dynamic by which the mind picks out elements of the surroundings and construes them as objects, is likewise a function of the locomotive rhythm. Objects are construed in the mind and acquire their relevance in terms of their resistance to the locomotive rhythm. On one level this is so obvious as to not seem worth mentioning since the first order of movement is to not run into things that don’t yield. But it also elaborates to the highest social levels so that emotional experience in interactions with other living beings is also a function of the locomotive rhythm. In the beginning of the imprinting process emotional projection extends to just the first few steps forward. But as locomotion is mastered emotional projection quickly extends all the way to an object of attraction, even one that is moving so that an intercept point can be factored in, and to the far horizon if that’s where the animal aims to go. As the complete sequence of footfalls to go from point A to point Z as quickly and efficiently as possible becomes computed, emotional projection has already grafted the locomotive rhythm onto an object of attraction and this is reflected in just how fast an animal proceeds toward it. Because the locomotive rhythm is the metric of well-being and right action, the standard against which stimuli are rated, objects are apprehended and construed on the most basic level of the animal mind as a function of resistance to emotional momentum. Thus when “painted” by the e-cog in the projection process, a feeling returns (is collected) as to whether or not the object in question can absorb and/or conduct the individual’s emotional momentum. More simply put, emotional projection addresses the question, can said object be accelerated and how much force will be required to do so? We can clearly see with puppies for example that their native impulse is to set things in motion. The world is to be accelerated. The question, as it were, puppies are constantly asking is; Can I move this object?—–and the first step to setting a thing in motion is to ask: Can I fit this into my mouth? If something can fit in the mouth, it can be carried and thus made to conform to the locomotive rhythm. The ingestive impulse is at the root of the locomotive rhythm metric of well-being because things that fit in the mouth are the easiest things to move and therefore are the most conductive. And if the size–or the history–of the object is such that it can absorb but not conduct enough emotional momentum, then the impulse becomes to rip it apart. For example, a predator chases a running prey. The prey is absorbing and conducting the predator’s emotional momentum. The prey is then caught and torn apart. It is still absorbing, but not conducting. In another context this dual function of emotional projection can be seen as well. For example, perhaps you’ve been smelled by a dog who wags its tail while it’s checking out your pant cuffs–Absorb emotional projection?—-> Yes; but then it looks up at your eyes and explodes with a bark in your face–Conduct emotional momentum?—-> NO. At the other end of the spectrum some things are small but do not absorb, such as things made of metal and so therefore they don’t get to the conductive phase. But in any eventuality all interactions with either inanimate objects or living beings are experienced and categorized in terms of this metric, the locomotive rhythm as the basis of well-being and the subsequent questions, can this object be accelerated and how much force will that take. I feel qualified to make such assertions given my experience training protection and police dogs because this work affords one a special vantage point from which to discern the mechanics by which dogs interact, the body language of play and prey-making and most importantly, fighting to overcome resistance. Protection training is based on the phenomenon of emotional projection, which links movement with the ingestive urge. The motor system and the locomotive rhythm as an internal metric of well-being that affects the viscera and heart through “vagal tone” is the most logical avenue for the evolution of impulse control and the capacity for deferred gratification, as opposed to the current consensus that proposes the advent of a high cognitive capacity such as the ability to entertain a Theory of Mind and intellectually sample the perspectives of others so as to calculate one’s prospects over Time. Additionally the mistake modern behaviorism is making is to assume that social behavior (as well as complex problem solving in animals) is complex. In reality, and again from my reading of animal behavior, social behavior while complex in the sense that many moving parts are forming a “multi-celled organism;” is actually the reduction of a complex situation in the minds of its constituents back down to a simple motive, i.e. reacquiring the locomotive rhythm, the individual’s optimal manner of moving effectively and efficiently so that this can be mapped onto complex situations and interactions with other beings. onto something complicated and otherwise confusing. These two values impart a sense of flow in the animal mind because all behavior, most especially interactions with other living beings, are at bedrock a transfer of force and before force can move, a direction for movement must first be determined. Aspects of the environment are categorized according to these two criteria, those things that increase sensations of pressure versus those things that decrease sensations of pressure. In this way Temperament converts an environmental value (high versus low, hard versus soft, near versus far, hot versus cold, fast versus slow) into a Temperamental value (predator and prey); which is necessary to being able to map the locomotive rhythm onto an object of attraction. Perceiving these two temperamental values has to occur if an animal is going to be able to respond coherently to a stimulus or situation. Nevertheless the important ramification of this template is that once the temperamental poles are identified so that there’s a direction for flow, it next allows the individual’s mind to discern, magnify and fixate upon…..
the threshold value …… / ……. between the two emotional poles so that a far more complex view of an object becomes available. With the threshold discerned, the two complementary phases of the locomotive rhythm, projection and collection, can be de-coupled from the autonomic process of movement and selectively highlighted. 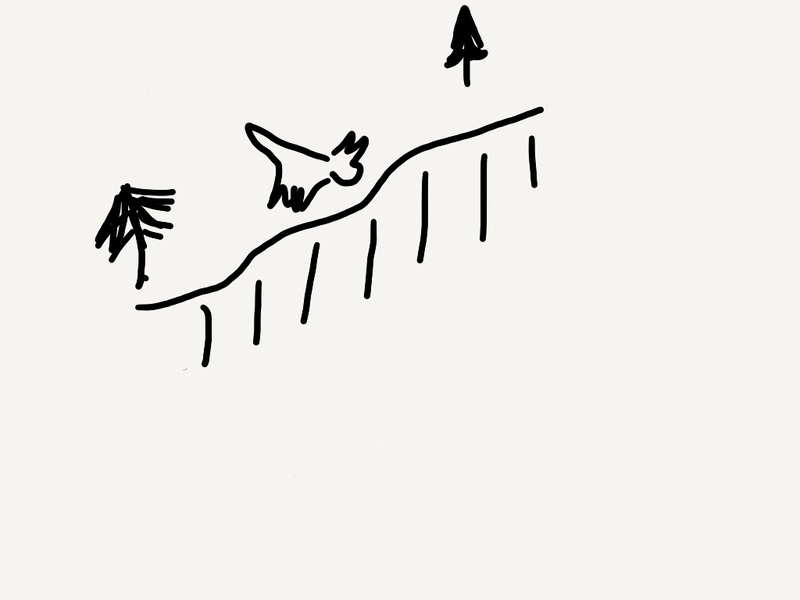 The first instance in the animal mind of decoupling collection from projection in the locomotive rhythm and focusing on the threshold value happens in terms of interacting with the environment as for example when encountering a break in the terrain, this is an objectification of the threshold value, an interruption of the flow; the need to traverse a divide or surmount an obstacle. On one side of the threshold is pressure, on the other side release from pressure. An environmental threshold of a change in terrain naturally elicits the urge to pause and shift the body weight onto the rear haunches (collection) in order to gather the force required to launch across (projection). The strength of the urge to hold back, to collect and wait, is directly proportional to the hunger for what’s on the other side of the divide. This kind of environmental interrupt would be the most primordial instance in the mind of an animal wherein it selectively directs its internal focus on one phase of the locomotive rhythm independent of the other, and at the same time associating the impulse to hold back with the flow of moving forward. The urge to hold oneself in check and gather muscle tension being equal to the appetite for flow. The animal mind is organized to coherently address such interruptions to its locomotive rhythm when encountered in the environment and likewise this same organization is applied in interactions with living beings, if the primordial thermodynamic values can be discerned. Evolutionarily, the first application of a threshold value to a living being so that thermodynamics could inform the participants, would occur in the oldest relationship that first evolved between living beings, the prey/predator dynamic. The threshold between the two prime emotional traits (Predator/Prey) is transcribed into a Temperamental value through the prey making urge. This is true of all species of animals whether they are predator or prey since the prey/predator dynamic is simply a higher elaboration of the thermodynamics of emotion, i.e. energy moving from high to low pressure. (And this is why deer when they feel safe play just like dogs because their emotion flows through the prey/predator dynamic in prey species just as it does in predator species.) All animals, birds and fish seek to move as fast as possible toward what they want, or as fast as possible away from what they fear as an innate internal metric of well-being. The zone of highest pressure constitutes the predatory aspect, the zone of lowest pressure constitutes the preyful aspect. The former projects and is the source of force, the latter absorbs and is the receiver of force. In the minds of animals all objects of attraction represent a reduction of pressure and perceptually contain the kernel of a preyful aspect. This template is true of animals, birds and fish and then evolves into the protocol by which an animal can feel how to interact coherently with any other living being under any and all contexts and throughout the course of any kind of relationship; from intercepting and bringing a prey animal to ground, or in the case of a prey animal, how to avoid being intercepted and brought to ground, as well as navigating social interactions with peers. Nature didn’t evolve different operating systems for different species of animals any more than computers evolved to have different basic operating systems for different kinds of computing. The capacity to hold back the compulsion to go forward did not evolve out of higher mental processes, it emerged from the physical capacities required to move the body through the environment, which then elaborated to the necessary things individuals must do to secure food or avoid becoming food, and then finally to live among their own kind. This interpretation of evolution is consistent with Darwinian logic, specifically the notion of evolutionary continuity and conservation. When this threshold is projected onto a complex Object-of-Resistance (such as another dog), the subject dog assigns this threshold value to the shoulder tension in the object dog because the forequarters are the physical assembly that gives an animal the capacity to remain upright and retain their ability to keep moving forward when being acted upon by an external force. The head region of the O-R represents High pressure, i.e. source of force (-), the hind end of an O-R represents release from pressure (+). The capacity of an object animal to resist being “accelerated” is perceived by the subject as a threshold value. The threshold, the precipice state between making or not making contact (revealed by shoulder tension) is like a valve and so the question becomes is it open (relaxed) or is it closed (tight). This brings us from the realm of instinct into the domain of feelings and Drive because with the threshold magnified, a range of responses along a gradient becomes available. and the individual seeks to manage sensations of pressure because it’s focus in on the tension it’s trying to manage. Because the object’s “valve” is closed, strong upward thrust in shoulder region, the body language of the subject is tentative, like walking on egg shells. The subject is responding to the object as if the object is a force acting on its body and so it works to keep that pressure manageable. While this is a socially coherent manner of perception in that the subject is holding itself back, it doesn’t get us very far in regards to impulse control because in pressure management strategies, output (action) almost immediately has to equal input (stimulation). The subjects’ shoulder assembly is as tight as the objects and the movements of the object are unsettling because they add even more load. This is the basis of a reactive or hyper-active dog with their capacity to hold back limited by the constant sense of being under pressure from an external force. Because balance is so paramount, configuring the p-cog either under (“submission”) or over (“dominance”) the shoulder tension in the object becomes the motive of the subject once they have become emotionally rooted into the object. Nevertheless because the threshold value is so pronounced and is the pivot point around which the subject is navigating its own movements, it can easily negotiate the emotional terrain and shift into a preferred emotional state, i.e. Hunger being stronger than Balance, this minimizes resistance. Or better put, resistance becomes arousing rather than unsettling. In this modality resistance is subsumed into hunger because the subject has become emotionally grounded and is now focusing on the positive preyful aspects of the object rather than its predatory aspects. Through emotional projection the subject is already feeling what it will be feeling (thanks to physical memories of its earliest imprint coming to the surface) after it gets past the divide just as if it’s looking past a change in the terrain and projecting into something it really wants. With resistance minimized the capacity to fine tune one’s movements via the threshold value becomes available because the subject is now able to sense that how it moves affects the object in a direct one-to-one correspondence. Every action has an equal and opposite reaction. (Newton’s 3rd Law of Motion is how an animal arrives at a sense of its Self, it’s how two integrate into one.) The subject can feel the feedback in the minimized state that it can’t feel in the maximized state. It feels that it is physically connected to the object in that it is acting as an extension of itself, that it controls the object rather than the object being a force acting on it and knocking it off balance, impeding its locomotive rhythm. It feels as if it is about to reacquire its locomotive rhythm because the subject perceives the object as an extension of its own body and is able to learn how to manipulate it, to actually articulate it just as it does with its own legs and body when it wants to move. It begins to feel in control of the object just as a child learning to ride a bike begins to feel in control of the forces acting on the bike as opposed to the pre-learning phases when the child feels as if it is the object of uncontrollable forces that it is barely resisting. In the hunger mode, the subject engages with a sensual rather than a sensitive orientation. The subject is aroused by the objects’ resistance. Sensuality in response to the threshold is how objects-of-resistance attain new emotional values along that gradient above, in fact, once the predatory aspect is wholly minimized the value can float up and down the scale because the negative is now perceived as granting access to the positive. 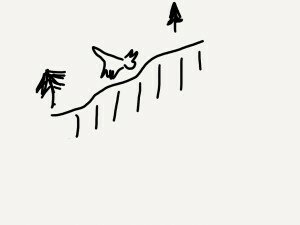 When hunger is paramount over balance, the collection phase has primacy over the projection phase (for reasons discussed later) and this makes it easy for the subject to hold itself back, just as if it’s adroitly navigating uncertain terrain with confidence in every step. This is because the subject can feel feedback from its own movements as being reflected in the objects’ movements. It has deftness of fine motor movement because it is referencing its physical center-of-gravity rather than trying to manage sensations of pressure in its head. It’s perception is thus progressively drawn to the objects’ center of gravity as opposed to its eyes. This is how emotional bonds form, through a process of integration, an “emotional coupling” between subject and object; an emotional transformation of mapping an increasingly precise point in subliminal awareness in the subject’s body, onto an increasingly precise point being discerned in the other beings’ body. The subliminal internal focal beam on the subjects’ p-cog becomes paired with the objects’ p-cog so that everything the object might do, deepens the subjects feeling of connection, and hence arousal, within his own body. He has attention and access to a sense of his body, and with a depth of pleasure that he otherwise wouldn’t have because it takes an external trigger to activate his sense of his own p-cog and release the physical memories of flow attached to it. Now the tension of the object becomes arousing, categorized as potential energy rather than as a limit on physical movement as is the case when balance is paramount relative to the threshold value. As they interact, smelling, snuffling and licking are the most likely impulses to come up, and the body deportment of the subject is soft rather than pushy leading them into play, and were they free to roam, ultimately to some kind of concerted team action for reasons we’ll discuss as we go on. Were the object dog to stiffen during the interaction, the subject dog collects and regroups to approach from a different angle or adopt a softer tack as he’s easily deflected or dissuaded given how deep his state of sensuality has become and can innately measure his movements just as if he’s navigating a tricky patch of ground. The negative or predatory aspect of the object is not perceived as a limit but more like a guardrail channeling his actions which little by little can enfold the object into a mutually gratifying dynamic since the object is likewise operating via the locomotive rhythm as a metric of its well being. And if circumstances were to permit, their movements will collectivize into synchronized movements along a common axis. They will form a long term relationship predicated on a common goal (H+) that can absorb and conduct their combined momenta. The capacity to perceive and then become aroused by the threshold value is especially pronounced in dogs given their high emotional capacity. This evolved due to the phenomenon of Neotony and its linkage to a pronounced sexual/sensuality, which is the ability to hold onto a feeling for a preyful aspect at a high rate of change. In this way resistance to the movement of emotion can be converted back to a feeling of flow. This linkage became highly developed in canines given the wolfs’ evolution as a group hunter and then which the domestication of the dog amplified exponentially given that the hunt was how these two different species integrated, just as it is for a group of wolves. Sociability is a simple rather than a complex phenomenon. It is not the result of a math module running the odds to produce a complex social structures. It’s the exact opposite, sociability represents a regression back to the prime and universal code of animal conduct that exists far below the level of conscious reasoning. The merging of the outside with the inside through resistance triggering earliest memories of flow, is a REGRESSION back to the prime and universal code of animal conduct rather than an elevation to a higher mental state. If a complex situation can be boiled down to its basic thermodynamic reality, ascertaining a direction of flow, then a coherent interaction can take place. If an individual is able to map the locomotive rhythm onto complex situations and then work the variables of the system as if one is hooked up to a biofeedback device, is the essence of impulse control and the heart of being social and this is a simple emotional process not a mental cogitative act. Resistance regresses the adult mind to its infant state of mind wherein emotional projection and coupling can occur. The subsequent elaboration of a back and forth exchange of emotional momentum between two or more beings that leads to a higher expression of movement, what we recognize as cooperative and social behavior, nonetheless remains consistent with all the principles of thermodynamics, most especially, the Constructal Law. Social is a function of simplicity, not complexity. When the subliminal focus on the subject’s p-cog is firmly welded to the external apprehension on the object’s p-cog, a matrix of “Pavlovian Equivalencies” acquired during the imprinting phase of infancy, kicks in so that even if the subject is completely rebuffed by the object, being sensually attuned within its body, it will then switch to the next higher modality that arises from this state, an OBJECTIFICATION of the threshold. Animals need to move when stimulated. Objects of attraction stimulate them, i.e. knock them off balance which then invests them with a degree of “acceleration” which they can only resolve by movement. When stimulated an animal feels compelled to move, and to move toward said object of displacement in order to resolve that emotional force of acceleration. And in order to move an animal configures its body around its physical center-of-gravity and it thereby associates its internal p-cog with objects of attraction. The stronger the hunger for the object, the stronger the fuse between it and the p-cog. The external object and the internal p-cog become synonymous, equivalent. In other words, even the process by which an object comes to take on its form in the mind of an animal is a function of the locomotive rhythm. Therefore whenever stimulated, an animal’s neurology automatically orients for an object as something it can move toward, and if the locomotive rhythm can be reacquired after making contact then the object becomes integrated into an animal’s sense of its Self. So the ever present need to reacquire the locomotive rhythm, and the Pavlovian equivalency imprinted in an animal’s mind between its physical center-of-gravity and external objects of attraction, combine to inspire a tendency to OBJECTIFY the threshold so that it becomes externally manifest as an object in its own right, a manifestation of the locomotive rhythm, after which it serves as a pivot point or fulcrum, an “emotional midpoint,” around which the interactants can orbit and more readily organize their collective movements. Otherwise until an object as an external manifestation of the midpoint becomes clear, as mentioned and depicted above, the threshold is physically manifested as High Muscle Tension in the forequarters. I call this resistance value “Upward Thrust” ……………..
………….. i.e. the amount of muscle tension an individual keeps poised in its forequarters so as to resist being knocked off balance and so that it can sustain forward motion. However rigidity in the forequarters countervails the capacity to move forward freely (dogs love to roll on their backs to escape the work of maintaining this muscle tension) and to calmly absorb external forces and capture them for subsequent integration, it’s akin to bracing oneself for impact (as in an untrained person in a fight) rather than integrating an attacker’s blows into forward flow (as in a trained martial artist). So in other words, to establish a pure locomotive rhythm, a subject dog that has projected its e-cog into another dog, perceives their shoulder tension as resistance to their capacity to reacquire a locomotive rhythm and convert the energy of stimulation into pure forward motion. When dogs mark an object with urine they are not declaring status or delineating territory. They are (1) seeking relief from the tension of being stimulated and not yet being able to move freely, and (2) from the systems point of view they are objectifying this threshold, anointing an object as a common point around which the interactants can align and synchronize so as to collectively move themselves toward a pure locomotive rhythm. One could say that their two respective centers-of-gravity are beginning the process of merging into one collective emotional center-of-gravity (H+); the fulcrum for the system they are going to create through their collectivized movements. Objectification of the threshold into a midpoint (which could be a stick, a toy, a raised surface, a puddle of water, a scent post), makes it easy for the more sensitive dog in the interaction to move, relieve itself and thereby soften physically and emotionally. Both dogs can project into this common object of attraction and not feel resistance toward it. They were attracted to each other from the start, but were not yet able to absorb each other’s emotional momentum until being able to move concertedly about the objectified midpoint, which allowed them to feel a reduction of shoulder tension by synchronizing their actions with the other individuals. Urine as a preyful essence ABSORBS emotion that’s projected and seeing the other dog move and then moving in kind CONDUCTS the emotional momentum. Thus they expose their genital area to the (tree/post/tuft) as an indirect means of making contact with the other, with the reduction in bladder tension lessening a sense of emotional pressure and maximizing a feeling of sensuality (hunger for contact) over sensitivity (fear of falling). 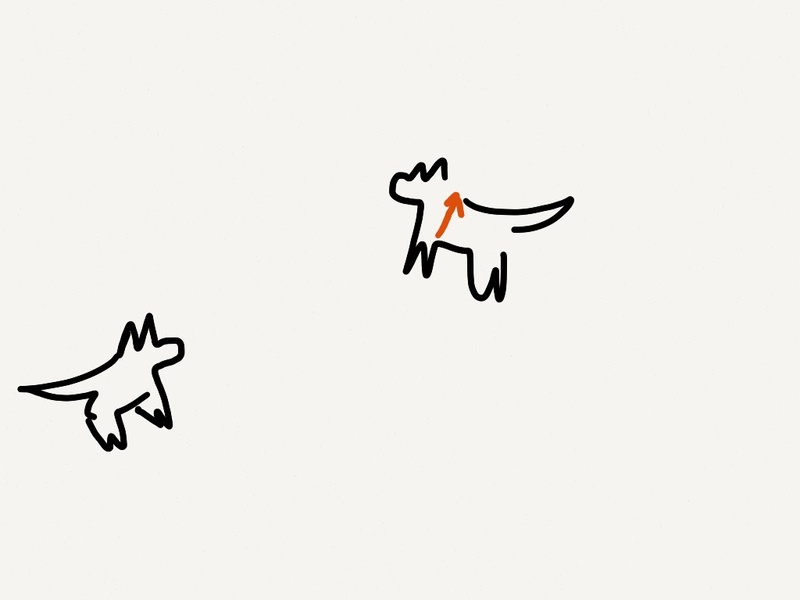 The good feeling engendered by moving and urinating they attribute to the other’s negative, and so now they’re engaging in an auto-tuning/feedback loop which is why we don’t see aggression with dogs intent on marking. Whereas if were true that dogs urinate to declare status or territory, logically this should increase aggression. (Imagine sitting on a park bench and a stranger comes up to you and declares ownership of your bench. That would induce hostility rather than agreeableness.) If conventional wisdom is that dogs mark things with their urine to declare status and/or ownership, then we would have to say that once dogs advertise a claim then other dogs are always agreeable to who has what status and rights to which territory. And this would mean that dogs are cooperative rather than competitive and which immediately contradicts the thesis that dogs mark things and areas in a competition for status or territory. It’s a self-annihilating logic loop. The more logical explanation is that dogs mark things to reduce pressure and reacquire their locomotive rhythm because they are social by nature, that sociability is predicated on the locomotive rhythm as a metric of well-being, and that interactions between animals is a function of the Constructal law, incorporating objects of resistance into the configuration as an improvement of flow. Once the process of “emotional ionization” is complete, one individual has “emotional momentum” to give, this is the one acting as the predator, and the complementing individual has emotional momentum to absorb, this is the one acting as the prey. And paradoxically from our intellectual perspective, the socially stronger dog will gravitate to the preyful polarity, not the predatory one. This isn’t incongruent from an energetic interpretation of behavior which notes that the prey “controls” the predator, not the other way around. If there isn’t a void (+) energy has nowhere to go. With this transformational projection, they are able to map their locomotive rhythm onto the body mechanics of the other dog. They feel as if the other dog’s p-cog is moving within them, they are now directly wired into what’s going on within their prospective partner. This means that to keep their own internals moving smoothly, they must move in a way that keeps their partners’ internals processing smoothly, an auto-tuning/feedback loop that they can delicately inflect being that they’re sensually attuned to the other dogs’ center mass. They are becoming emotionally coupled. The key to this feedback loop is again the locomotive rhythm, the organisms’ internal metric of well being. The locomotive rhythm is characterized by an output (all four legs extended) and an input (all four legs retracted) in equal yet opposite counterbalance. An individual can only extend its reach as far as the body can then recollect itself above the new position of its center-of-gravity. The two phases must always be in an equal and opposite state of counterbalance so that output equals input, and vice versa. So once one individual has projected its emotional center-of-gravity into the form of a thing it’s attracted to, in order to reacquire its locomotive rhythm, it will move in a way that complements the other just as if the other being is the opposite phase of the locomotive rhythm, the other half of that wave action. This initiates an impulse to reciprocate in kind in the partner because they too have the same need to reacquire their locomotive rhythm. If one individual is in its output phase (predator pole), the other individual must be in an input phase (preyful pole), and then they must reverse these roles so that both can collect or project respectively to keep their internal locomotive rhythm going and retain the sense of remaining upright and in motion, i.e the feeling of being in flow. The locomotive rhythm is a wave that moves through the body. That’s what physical motion is, an up and down action that the body rides, limbs and torso undulating in its motion. The dog associates this wave as the “reason” for its success in obtaining an object of attraction. The object is swept up into a rolling sequence of muscles tightening and releasing, incorporated into the feeling of a wave. This integration of the muscle and structural components of the body into one smooth motion, ties all the various autonomic processes of the body into this experience as well unleashing a matrix of Pavlovian Equivalencies by which the elements of the surroundings become tied together within the dog’s mind. For example, Pavlov’s dog didn’t salivate because he anticipated getting food, or was, strictly speaking, associating the bell with the food, rather, the dog felt that the act of salivation materialized the food. When someone brought him food, he didn’t construe it as a person walking across a room with the intention of bringing him some food. He felt that his act of salivation moved the person bearing food toward him. When interactants become aware of their partner as an extension of their own body, they perceive their connection as a function of the same wave form that carries them about, their partner acting out the other half of the wave form. They see the world responding to how they are feeling. This involves the autonomic processes of their body that are intertwined with this as well, most especially breathing as this is the most dynamic function inherent in running fast. A deep and metered breath, the whole body as a resonating chamber, the lungs expanding and contracting as a bellows, is the same as running at full speed. Then the whole catalogue of Pavlovian Equivalencies kicks in, object of attraction synonymous with the physical center-of-gravity, muscle tension of the hind end equivalent with something soft in the jaw, equivalent with supple shoulders and flexible torso, etc., etc.. All of this in a pro-social dog is evoked simply by looking at the Object. When in this state if the other interactant were to stop moving, for example either because it’s tired or became distracted, the collected partner may attempt to mount it due to the sensuality inherent in emotional coupling so that the running motor pattern is displaced into pelvic thrusting, or more likely if excited, will bark at it in order to reacquire the locomotive rhythm via a strong breathing mechanics. The Subject doesn’t bark to motivate the Object to move as if the Object moves about on its own power, rather the deep, metered breath of the Subject (strong wave action) is in its mind, the force that makes the Object move in the first place. In the animal mind what’s happening inside is what makes things happen outside. (On the other hand the human intellect occupies the polar opposite space in consciousness as in what happens outside is what causes what happens inside. This is because we use thoughts to tie elements of our surroundings together rather than the wave forms of physiological and physical action.) 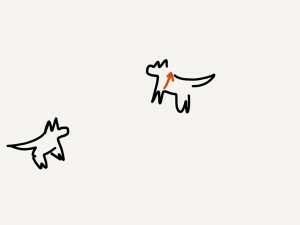 A dog throws out a bark just as it throws out a step, through the projection of the e-cog, only now once focused on its breath without actually moving forward because now it feels as if the Object is fully integrated into its sense of its own body. Due to this auto-tuning/feedback loop arising from the phenomenon of emotional projection and the sense of emotional well-being as a function of the locomotive rhythm, we observe an innate tendency in dogs to synchronize their movements and move along a common arc because this is the easiest way to keep the two phases in equal/opposite counterbalance and maintain their respective experiences of flow. The object-of-connection (the so-called resource) serves as an external manifestation of each one’s p-cog. 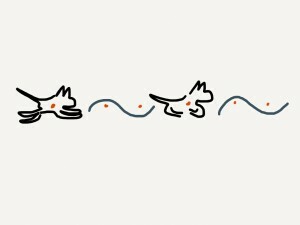 Indeed it looks like two dogs are competing for something but in fact since they are both emotionally rooted into the object as an indirect means of making contact with each other, until they are moving toward an optimal rhythm there will be friction. What mitigates friction degrading into violence is that to reacquire a feeling of well being they must reconcile their manner and movement with the manner and movements of the other dog. The locomotive rhythm incites sociability. The dog that opts for the preyful position is not showing respect or trying to appease the dog that looks to us as trying to assert itself over the other. Rather he is reliving positive physical memories of collecting himself for a later expression of emotional momentum. He may even be doing this under a state of great duress and thus presenting the picture of a hapless and pathetic body language, but deep, deep down even an overly “submissive” dog is taking an immediate-moment pleasure of gathering himself for release. The more confident dog at the other end of the temperamental spectrum is doing the same but with great élan, so we misinterpret this dynamism for dominance, but we will see that over the course of time our so called submissive individual will start to gain more and more confidence in its “sniveling” approach and to such a degree that it will rush toward a “dominant” the moment it gets a whiff of tension in the air and immobilize it with intense whining and face licking, all of which sensualizes and hence paralyzes that individual. The “submissive” is being actively aggressive with its so called passiveness. So from our intellectual perspective it looks as if an individual when it holds back is deferring an immediate-moment impulse for a later gratification, but in his mind he is already experiencing a positive flow and isn’t waiting for anything. Social interactions have a system’s logic, not an individuated one, with physical memories providing the complementary states that allow the two individuals to fit as one; physical memories when they are regressed to the core p-cog smooth wave experience, inform in the moment. onto situations (search and rescue, bomb/narc detection, car rides, obedience trials, herding, police service, protection, handicap assist, etc., etc..) that other species find hopelessly complex as it is impenetrable to their instinctive manner of apprehension. They can’t reduce their senses to apprehend the wave form based on two bodies configuration around their respective center masses. We could consider the Bekoff ABC video from the perspective of the locomotive rhythm as the metric of well being. The Dane and the smaller brown dog engage and a state of tension arises between them, and within them, just as if they are being raised to a height. They are building up an internal force. They are both perceiving the shoulder tension in the other as an impediment to the flow of force. Then the big dog stomps the ground and this quick movement and lowering of the shoulder collapses the state of tension and which is immediately followed by the Dane collecting himself onto his hind end and extending his rump into the air, the “bow” motion. This move addresses the fundamental thermodynamic question around which the animal mind is configured, which direction is force going to flow. This collecting move of the input phase of the locomotive rhythm absorbs the force of impact WERE THEY TO COLLIDE. The Dane is not inviting the other dog to play as why for example would a bow constitute an invitation to play? Rather the Dane is displaying he can absorb the emotional momentum that the brown dog has projected into him. He collects himself, shifts his own internal momentum because he can feel that going forward won’t render a pure locomotive rhythm given the brown dog’s body tension. The play bow serves to absorb the brown dog’s “fall;” i.e. it channels the brown dog’s acceleration (disturbance of equilibrium) into emotional momentum (emotionally grounded into the body of the Dane) so that the little dog feels absorbed by the big dog. The play bow IS NOT INTENTIONAL on the Dane’s part but rather reflects that they are switching from two respective individuated points of view to a systems logic, a group energy. The play bow is not signaling “I want to play.” Rather, the lowering of the head (predatory aspect) and the raising of the hind end (preyful aspect) transmutes the Dane into an emotional ground for the other dog and this makes the other dog feel absorbed and safe. The brown dog has projected its p-cog and mapped its locomotive rhythm onto the Dane (this has already occurred for the Dane which is why he can shift his momentum rearward) and so this begins the process of feeling safe enough to make physical contact and the brown dog rushes forward in a short burst of movement. The most important clue in this video is when the brown dog goes forward almost immediately he winces and braces for impact by turning his head. He’s feeling absorbed, which is why he has gone forward, but only to a point, there are some physical memories of “crashes” embedded in his e-cog as well and so he doesn’t yet feel that the Dane can wholly CONDUCT the force of acceleration he’s invested with. 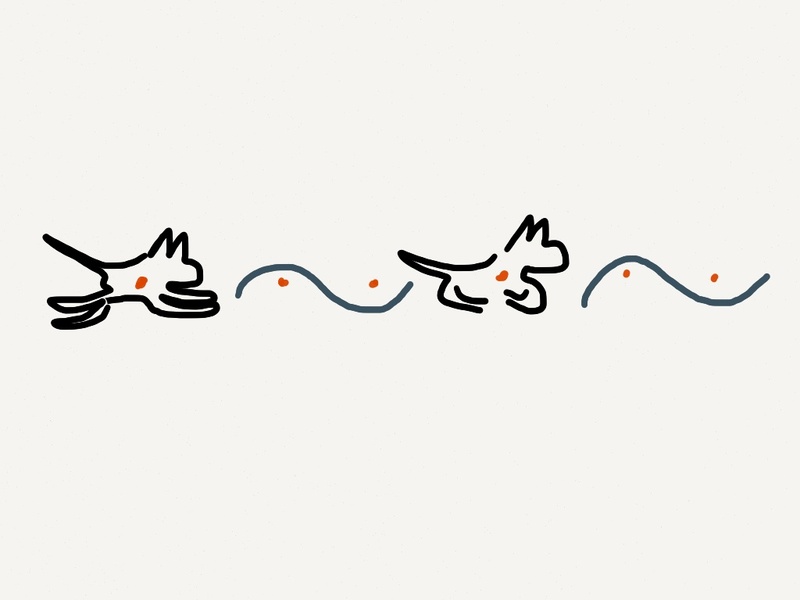 Subsequently in the next sequence the brown dog dissipates the excess force that he isn’t able to transfer directly to the Dane into some side-to-side and running-in-place movements. The two dogs are trying to reacquire their optimal locomotive rhythm and because of the phenomenon of acceleration when a frame of mind collapses, which then induces a need to be absorbed, a systems’ logic takes over because the only way they can each reacquire their locomotive rhythm is by becoming aligned and in sync so that they achieve it in tandem, what we otherwise call playing. An object-of-connection (H+) facilitates this process exponentially. So what’s the distinction between this interpretation and the so called signaling of intention? Why does the Dane play bow if not to invite the other dog to join him? Why couldn’t we say the Dane is signaling that he can absorb the other dog’s momentum? The Dane isn’t inviting the other dog to play, rather, due to the overpowering influence of physical memories, and an obvious history of positive social experiences, he’s ALREADY IN PLAY and is gathering his energy for a prey-making pounce, the move backwards that shifts his weight onto his hind end, not only gathers force but simultaneously inhibits the motor impulse to spring forward. He isn’t signaling, he’s already playing and because the projecting predator pole is occupied by the brown dog (-), he flips to the collecting preyful pole (+) in order to fit into the same frame of reference and satisfy the ever present thermodynamic strictures on how energy is to move. The Dane knows this by his sensual feeling aroused by the brown dog’s shoulder tension, which arose from his subliminal focus on his hind end while his focal gaze is enraptured by the preyful aspects of the brown dogs’ body. The primal impulse of collecting force inhibits the primal impulse of projecting force. Because of his positive social experiences and good nature, the Dane is able to focus on the dog’s physical center-of-gravity, its center mass, rather than becoming FIXATED on its eyes. He is aroused by the other dog’s body, he is feeling sensual, he’s not going by the form of the dog but rather by how the dog is configured around its center mass. And since the other dog is projecting force toward him he can immediately feel that the dog isn’t prepared to absorb his momentum, thus the Dane checks himself with the positive physical memory of collecting-rearward-for-the-spring-forward-when-the-moment-is right. The Dane can feel that it wouldn’t feel good to rush toward the other dog because this would collapse the sensual feeling that he is already enjoying. Why is being collected self-reinforcing? In the animal mind, potential energy is a more powerful motivation and reinforcement than the actual realization of energy. The process of attaining an object of attraction is more rewarding than actually possessing said object (hence dogs love to drop their toys into hard to reach places).Therefore when a prey is seized in its jaws, the predator gives the collecting phase of the locomotive rhythm credit (the potentiating of the body with muscle tension) for the resulting success (just as a marksman gives the moments of holding his breath and taking aim credit for the placement of the round), rather than the springing forward phase. In early litter experiences puppies are being imprinted with collecting as the source of the fun derived from playing, and this quickly amplifies into a pronounced play bow display (which really should be called collecting). In other words, there is a built in bias in the emotional makeup of an animal towards sociability given the locomotive rhythm as the metric of well being. The welling-up collecting phase of the locomotive rhythm serves as the basis for bite inhibition and deferred gratification because it is as primal as projecting and is actually more rewarding. Furthermore because the animal mind associates muscle tension in its hind end, the source of its propulsive force, with something soft in its mouth, a Pavlovian Equivalency, when a dog senses something sensual about the other dog (preyful aspect), it wants to collect itself to acquire muscle tension and it thereby already feels as if it has something soft and warm in its jaws. It’s been regressed to a puppy state of mind. Because this simple code, the capacity to map the locomotive rhythm onto complex objects-of-resistance, is the predominant basis of the canine mind, far more than it is with any other species, is why only the dog can be protection trained and not end up psychopathically violent as would happen to a cat, or more revealingly to a primate, the latter being particularly telling since it has a far more evolved brain and theoretically, were the current paradigm of modern behaviorism correct that cognition is the basis of the high social virtues and the capacity to inhibit primal impulses, should be MORE ENABLED to restrain itself than the far more primordial dog. The properly trained protection dogs gains self control through the process because the collecting phase is amplified even more. If Frans De Waal is right, then I believe my application of the Constructal law to the canine mind is the best interpretation of how the motor system would be engaged in emotional experience and the nature of animal behavior. When this rhythm is mapped onto another being, the feedback-tuning loop requires that the individual will try to optimize its internal rhythm by syncing up and aligning with how the object-of-resistance conducts itself. The subject is trying to configure its body around the e-cog it’s projected into the object’s body. Thus how a dog responds to others is how it collects its body around a new point in Time. This makes sense to me intuitively. I think its a problem for humans as well, (and may account for mental illness? – a laymans view). ‘The transfer of emotional force follows the exact same physics as the transfer of physical force’. It was that quote that led me to send you details of David Hamilton’s reference to the piano experiment and similar – where just thinking about doing a physical exercise and actually ‘doing’ the physical exercise causes similar changes in the brain – amazing! How we humans perceive the world is as a result of who we are, although unless you do a bit a of work on yourself people don’t necessarily appreciate it. I wrote a post on ‘judgement in dog ownership’ the other day. It was kindly pointed out to me that the judgement is how I perceive it. And of course they were right!. If I have a different view of myself in the world, I wouldn’t necessarily perceive judgement, I may just be content that different people have different points of view and be ok with it. The other day, I was driving somewhere and I had negative thoughts about 3 different people in the space of the 1 hour drive. All different people, different kinds of relationships, with a common thought pattern “they are all taking me for granted”. What amused me when I noticed it was that I hadn’t seen any of these three people in that space of time, it was all a story I was playing in my head based on how I was feeling at the time. Of course, once I noticed it I could see it as part of my attitude, but I wasn’t always so self-aware. Previously I would have carried on with my victim mentality, until something changed my mood! I will be going back to study your post some more! I was resistant to the concept, but I think I finally got a feel for p-cog projection today while driving. I realized that I could sense within the body my relative distance from different cars on the road without the need for any computation of distances. And that the brain needn’t act as a super-computer since math is just a way to describe nature and not an innate process being executed by it. Seems fairly obvious, I guess, now that I think about it. When cars in front would slow, it felt like pressure and I was compelled to find a different lane/route that would allow me to maintain momentum. The fact that all this can be accomplished while the brain is preoccupied with a conversation and directions is pretty telling. I think I recently witnessed it in dogs also while throwing a toy that hit an obstacle in its trajectory and came to a sudden stop. The dog running for it at full speed also came to a screeching halt rather than continuing on to grab the now easier to get prey, which is what I would expect an animal “seeking” its “reward” to do. That’s exactly right and it cannot be overstated. When we drive a car we are physically connected to an energy system and our animal mind is running the show and thereby providing our most vivid window into the nature of the animal experience. When driving a car we are able to parse apart instinct from emotion and thoughts from feeling. So paradoxically, our most subjective experience becomes our most objective tool of inquiry. Our body’s physical center of gravity merges with the cars’ mass and becomes our emotional center of gravity, which we then project into other objects-of-resistance in order to compute their relative motion, unconsciously, or rather, emotionally given that emotion contains the laws of motion. Following from this are states of pressure and release from pressure due to proximity to other cars, the feeling of flow centered in our heart, deep inner stress as emotional ballast that is simultaneously projected into objects of resistance, it all comes plainly into view. There is no math module running algorithms (although these are capable of describing it) because what we are sensing and feeling are electrostatic pressures and magnetic pulls and pushes that are embedded in our animal makeup and which function autonomically to render an emotional experience. Are you referring to driving specifically, as in road rage or some other phenomenon? Trying to get a sense of how this would manifest in driving scenario. Yes, every part of the process of driving (other than thoughts) flows from emotional projection. First one gets a feel for the combined physical masses of their body merged with the car’s. This becomes their emotional center-of-gravity complete with the momentum of the car, its interaction with the road, and the physical memories of past driving experiences. This is then projected onto other cars, obstacles and the roadway ahead in order to gauge their capacity to absorb and conduct one’s emotional momentum. Furthermore this comes to include the respective speeds of all the cars in any given frame of reference. The entirety of the primordial emotional dynamic becomes visible if one then parses apart their experience into sensations of instinct, thoughts, emotion (attraction to various relevant elements of the surroundings including the destination) and feelings (state of suspension centered in the heart). Road rage would be when all that momentum is interrupted and the sensations trigger instinct and then morbid violent thoughts as to who is responsible for the interruption, which of course drags up from the past that driver’s previous experiences of sudden interruptions which is why they overreact to what another motorist did.